Share Your Memories & You Could Win $100! | Winners Drink Milk! Share Your Memories & You Could Win $100! November is the month to be spent with friends and family, which is the perfect time for sharing and saving family stories. Sitting around the big oak table, everyone bringing their family favorite dish to pass, the smell of yeast rolls mingling with roast turkey set the stage for a great Thanksgiving meal and conversation! Memories from the older folks and lots of questions from the younger family members keep everyone gathered and enjoying each other. There is always that one story where the spiced apples hit the floor and splashed all over the tablecloth and wall! Everyone enjoys hearing a funny or embarrassing story of their co-worker, friend, and learning about someone’s family is also a great bonding experience. It helps friends and new family members see that they have a lot more in common with each other than they would have thought previously. 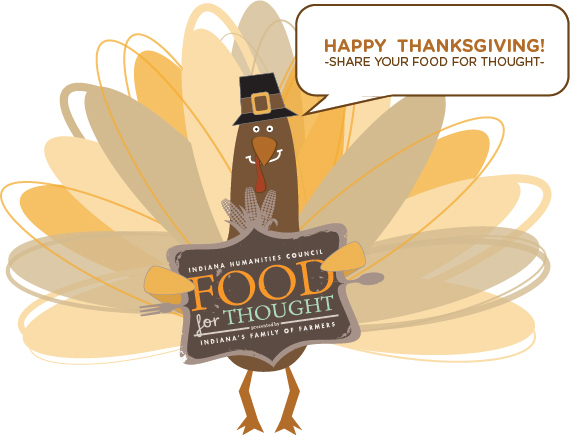 Submit a Thanksgiving story to the Indiana Humanities Council and win a Thanksgiving Dinner, courtesy of Indiana’s Family of Farmers! Thanksgiving brings an assortment of culturally significant foods that we pass down through generations. In many ways, the traditional Thanksgiving dinner symbolizes a unique shared food heritage, encompassing native crops and “New World” advantages. What does it symbolize for you and your family? How do you personalize the national tradition? What does your family cook outside of the typical Thanksgiving meal, and why do you celebrate this food tradition? Why are you thankful for your Thanksgiving meal? Share a memory about a Thanksgiving meal disaster. Share a Thanksgiving tradition or memory and win! The Indiana Humanities will draw two winners and give them $100 towards a Thanksgiving meal. And, you can submit the same story to WFYI’s Spirited Chase for a chance to have your story read on-air.